Add stability to your elbow joint and the surrounding tendons and muscles with an elbow brace, band or arm sleeve. With a variety of levels of support available from mild, moderate to maximum, you will be able to find the level of compression and stability you want for your sport. Shop elbow braces for tennis, golf, football, weightlifting, and more sports. 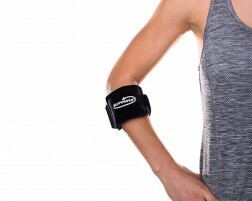 There are also compression elbow sleeves or bicep braces for daily use or non-contact sports. Help prevent elbow injuries by choosing to protect your joints with a brace that won't impede your activities. Need help selecting? Try our interactive tool, Brace Advisor or check out this guide on an explanation on the different types of elbow braces. If you have injured your elbow, start the recovery process by resting, icing, compressing, and elevating. Rest by taking a few days off from your sport. For easy cold therapy, use an elbow ice pack. 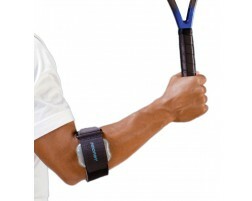 Compress with a brace for your elbow injury: hyperextension, tennis elbow, golf elbow, or general elbow tendonitis. Lastly, elevate the injured area above your heart by keeping your arm above your head.